Reese & Bigalow is a duo that represents from the infamous Wood Street in Jackson, MS. They first started out in the early nineties as members of The Renegades. The group was one of the first acts to represent for the city of Jackson and eventually paved the way for many other artists, Reese and Bigalow left the group after their initial release and formed their duet while Lon Trigga of The Renegades went on to form the notorious, Wood Street Playaz. 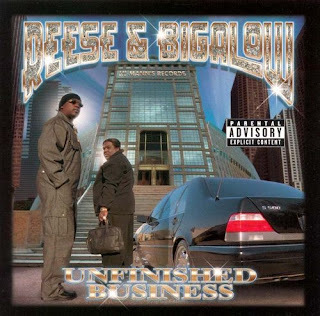 Unfinished Business is their second album and it was released in 2000 on Lil Mann's Records. Production is equally split between Mike B, Gutta Boy and JB Money. The beats are Southern in composure and while most of them are fairly enjoyable, there are some that lack a bit of energy and edginess. The three producers do a decent job at constructing the rhythms but it's their simple approach at times that takes a hit. Lyrically, the album is quite good. Both, Reese and Bigalow are pretty adequate on the microphone and their verbal chemistry is also reasonably strong. Their rhymes display constant word play and are also delivered at a fair rate. Guest appearances are courtesy of 20-2-Life, PSK-13, South Park Mexican, Ska-Face Al Capone, Bone Crusher, Crooked Lettaz, King Goldi, Poetic Preachaz, Dez, J2, Frank Da Macka and Fe-Fe. The album closes out with a commendable total of sixteen tracks and the rock solid guest list makes it that much harder to deny. Overall it's a noble release that has a good amount of highs instead of the lows. The only knock on it is the basic production but even with that blemish the album manages to sustain itself. Reese & Bigalow went on to release one more album in 2002 before slowly fading out of the music industry. The groups' unlucky demise was brought by the hands of the Atlanta based rapper known as Bone Crusher. 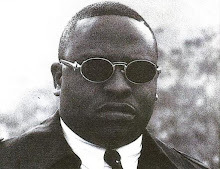 Bone, who was signed to Jermaine Dupri's label known as So So Def, was once a loyal friend who quickly turned foe over ownership of a single track. The song in question is called "Neva Sked" and it comes from Reese & Bigalow's 2002 release known as, "Playa Music." The track featured a verse from Bone Crusher and Killer Mike. It was produced by Avery Johnson and was purchased by Reese & Bigalow for their new album. The exact same song was released by Bone Crusher for his debut album in the year 2003 and the only major difference was the verses of Reese & Bigalow were removed and replaced with a verse from T.I. The title was also changed to "Never Scared." Bone Crusher's version of the song ended up being a chart topping hit and eventually propelled him into the limelight. Reese & Bigalow did file a law suit against Bone Crusher over copyright infringement but they never got the recognition or the praise for the original song. They were most likely paid off by the deep pockets of Jermaine Dupri and were supposedly told to keep their mouths shut about the whole issue. It's unfortunate what happened to Reese & Bigalow but then again it just goes to show how corrupt some of these major labels are and how how cruel this music industry can be at times.